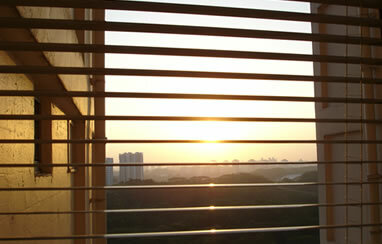 It has been raining non stop since yesterday in Singapore. 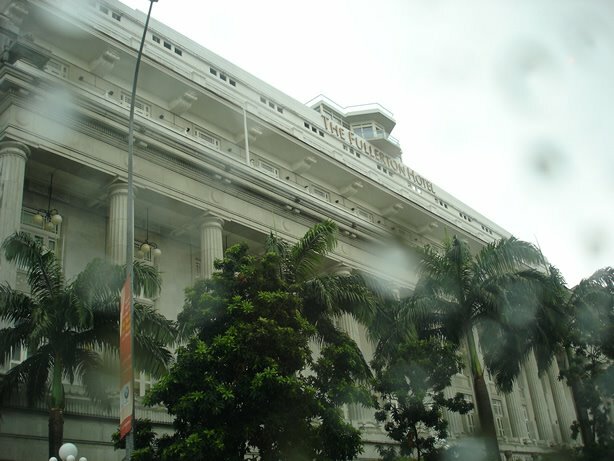 It was wet wet wet and this is a photo for today, a rainy day picture of The Fullerton Hotel. The smeared areas are rain drops on the glass. Freshly taken less than 1 hour ago. The weather bereau forcasts that it will continue to rain for the next 2 weeks. For visitors from Malaysia, wishing you all a Happy Merdeka Day! If you like this Singapore Daily Picture, you can also visit http://kualalumpurdailyphoto.blogspot.com since today's Malaysia's National Day. 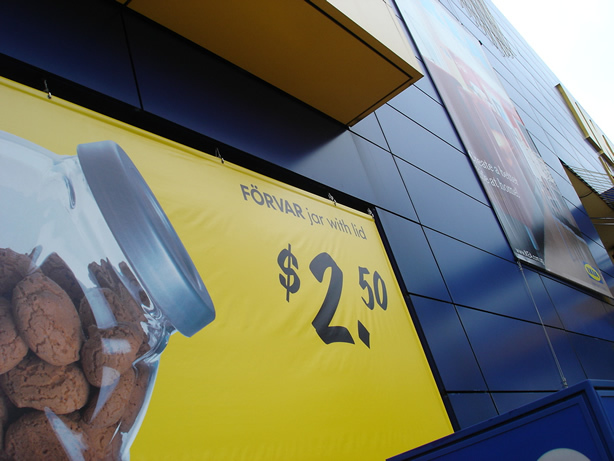 FÖRVAR jar with lid $2.50. Great marketing eh? Looks so cheap. 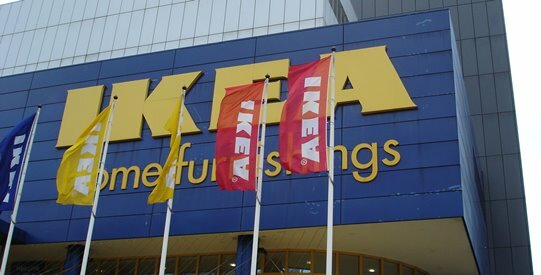 IKEA is one of many Singaporeans favourite haunt. The store is always packed. The IKEA restaurant is always so pack that you have to wait and wait to get a seat. The Big IKEA word with the IKEA flags at the Alexandra Store. 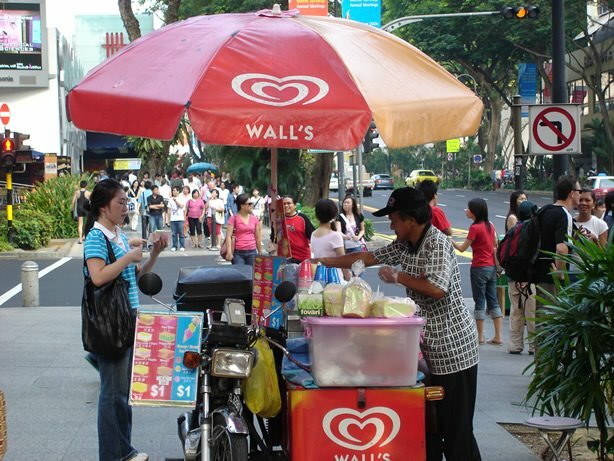 Another permanent display at Orchard Road is the ice-cream carts that you now see along most road junctions along Orchard Road. They sell ice cream for only $1. They are usually sold by 'uncles' or 'aunties'. Most of them are uncles, but you do get see some aunties vendors. The ice cream comes in variety of flavours. Choc Chips, Vanilla, and unique flavours like Durian, Lychee etc. It all depends on where the vendors get their stocks from. Usually it is Walls, Magnolia or Kings. When you order, the uncle will take out a block of ice cream from his container that's filled with dry ice. He will then slice out ice cream the size about a bar of soap. Then he asks you, wafer, bread or cup. The ice cream bar will then be sandwich between 2 pieces of wafers if you request for wafer. If you request bread, the bread will wrap around the ice cream bar. Their bread are usually colourful bread, with pink and green streaks. haha.. Cups will be your choice if you prefer not to get messy and use a spoon to eat. WAIT, you say... (from overseas readers of this blog) Ice cream with bread? Yes. Try it at home. Get a slice of bread and wrap around your favourite ice cream. They taste rather good. So, visitors to Singapore, pop by these uncles and aunties for a cheap $1 treat when you are visiting. 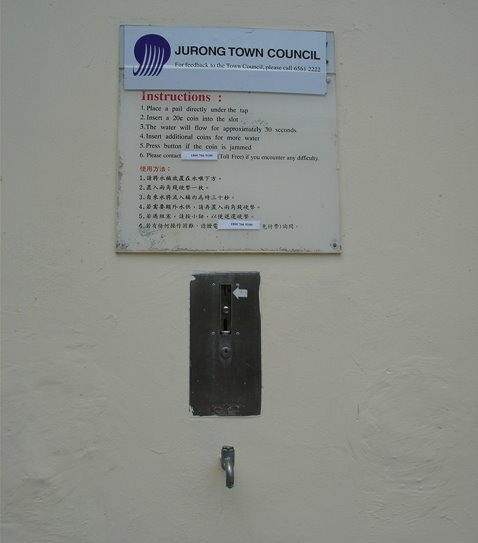 It's hot and humid in Singapore, and their ice cream provides a quick refreshing perk. Question: What if I am a snob, and I dont eat cheap ice cream. 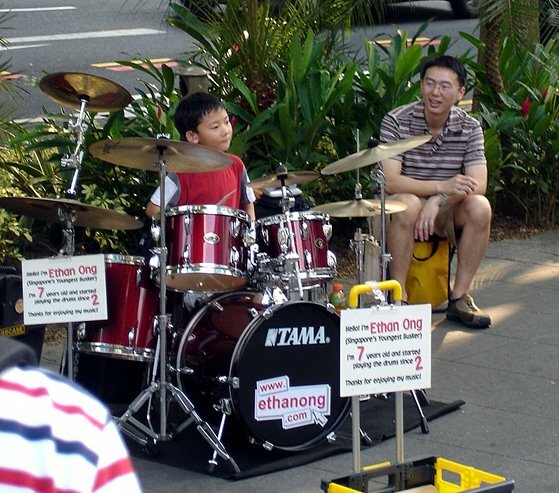 Locals who stroll along Orchard Road during the weekends will see Ethan performing. Did you know he is Singapore's youngest busker? 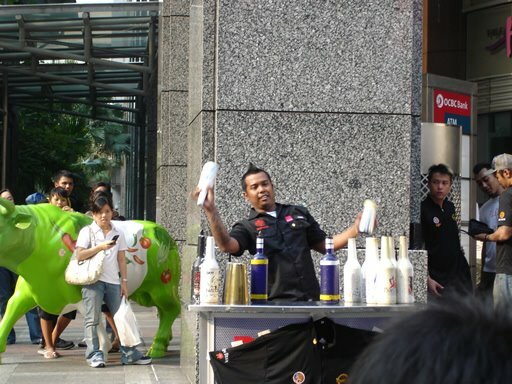 Visitors from overseas, if you are in Singapore, and want to see him, he is usually busking in front of Paragon Shopping Centre. Was walking around in Tangs yesterday (25 Aug) and the in-store announcement had meet Kit Chan at the hand-bags section. They were selling the Forbidden City tickets at 20% off. 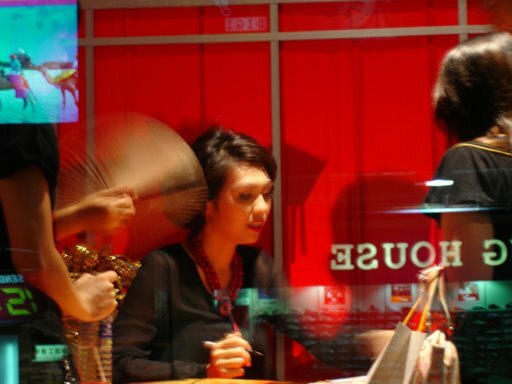 Then when you walk outside the store, you can see Kit Chan in the window display, with fans all lining up to get her autograph. Pardon for the not so clear picture. There was a glass and it had reflections and I had to turn off the flash to take the picture. Why do you need to "chope" seats? People will want to eat their food immediately after getting their food. Not walk around carrying the delicious bowl filled with hot soup, (or maybe a heavy claypot) trying to balance it, prevent it from spilling, salivating at the same time, and there's no place to sit and eat. How pathetic that would be. The tissue is from a colleague who recently went to Japan, they give out lots of free advert tissues. 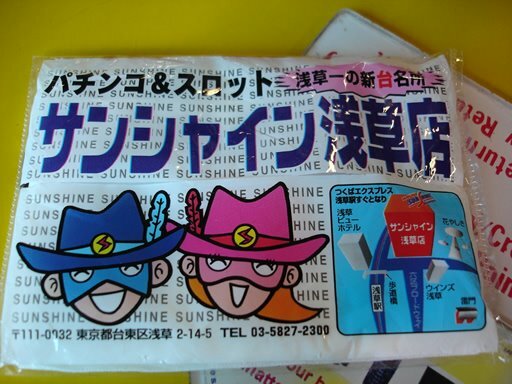 Here's one of the many packets that you can collect as souvenir from Japan. 1. Drink Dry The Milo Truck. 2. Fold 10,000 cranes in ONE hour. 3. World's fastest Crane Folder. 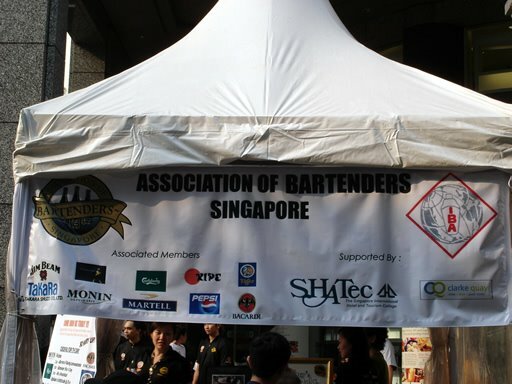 All 3 will go into the Singapore Book of Records. 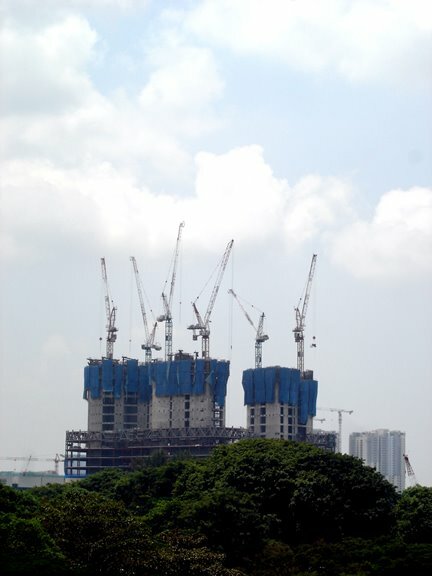 The cranes are folded for charity. Well, here's plus, if you want to learn how to fold a crane, click here. 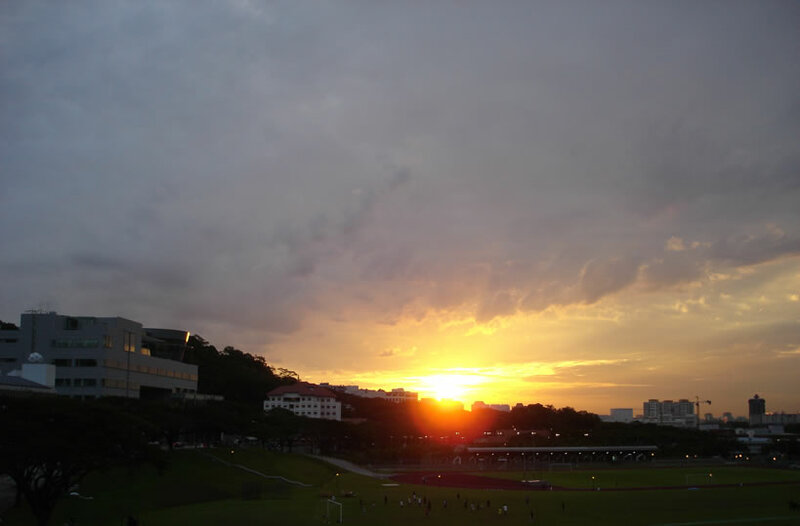 Evening time, around 7 pm, most office staff left an hour ago, students are playing games at the NUS Football and Multipurpose Fields. This is the facade of the many Lecture Theatres (LT) in NUS. Like universities in US or elsewhere, you have buildings name after people. 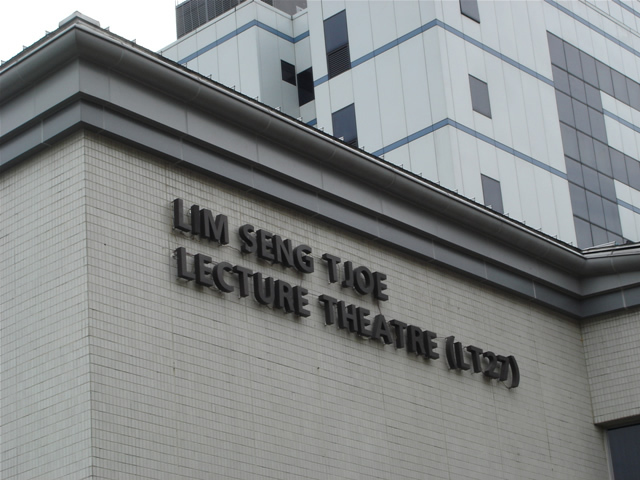 This theatre is named after Lim Seng Tjoe. Anyone knows who he is? LT27 is also one of the biggest LTs around with capacity of over 600. 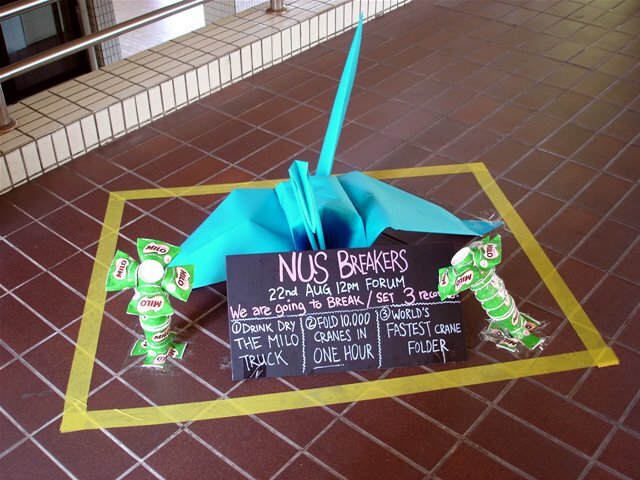 Many Computing and also Science students in NUS would be familiar with it. What are these? These are also vegetable farms. But they are the more modern compared to yesterday's. Don't they look like aeroplane hangars? 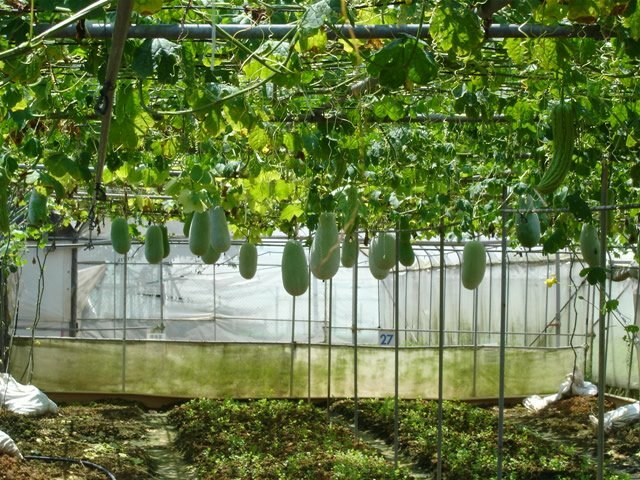 Hmmm for you who are visiting from big cities, have you seen a vegetable farm? 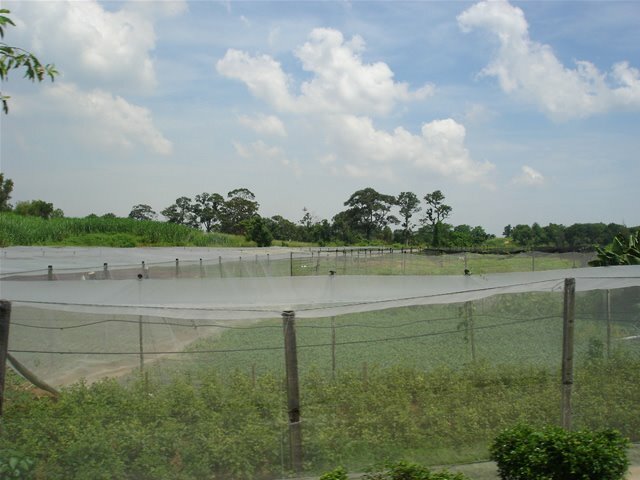 Do you know how vegetables are grown? 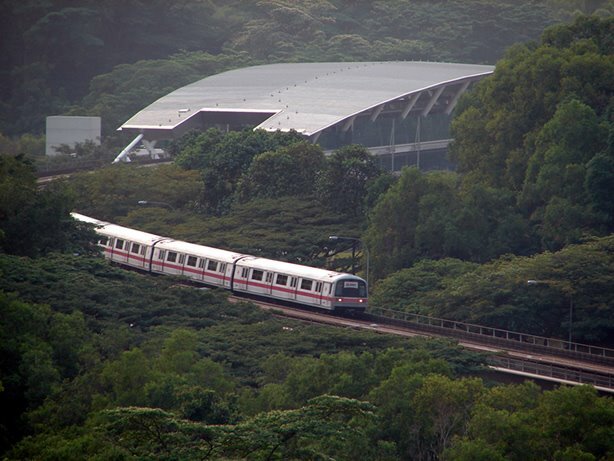 Well, in super modern Singapore, there are still vegetable farms! 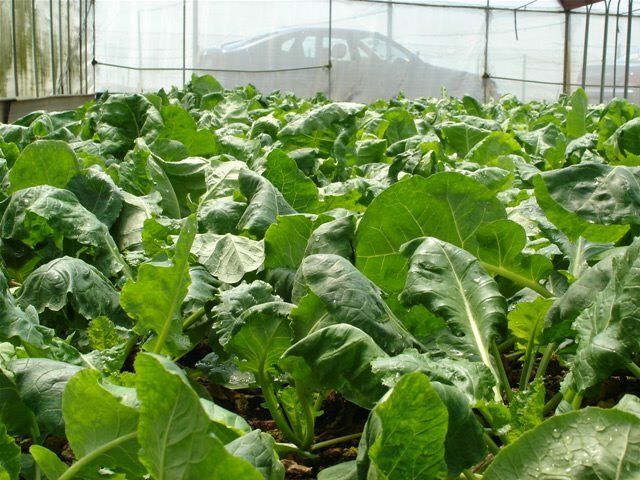 This is a snap shot of the vegetables all covered in netting, to prevent pest from invading. 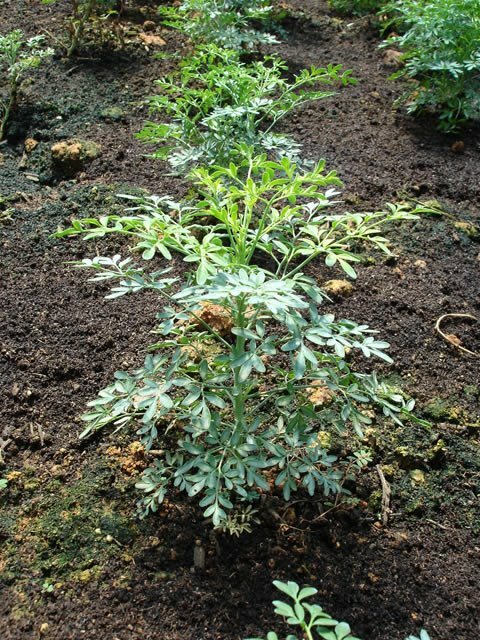 The name of the plant is Ruta. 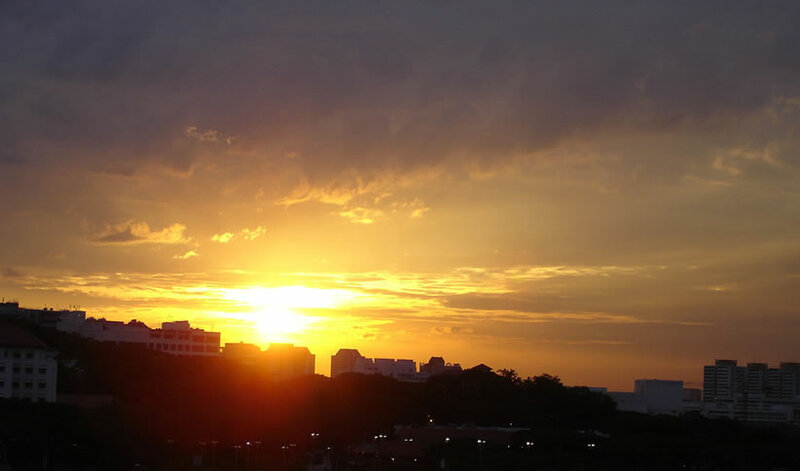 We call it "Cao Cao" in Hokkien. This plant brings fond memories because my grandma used to plant them at home before she moved home to heaven above. 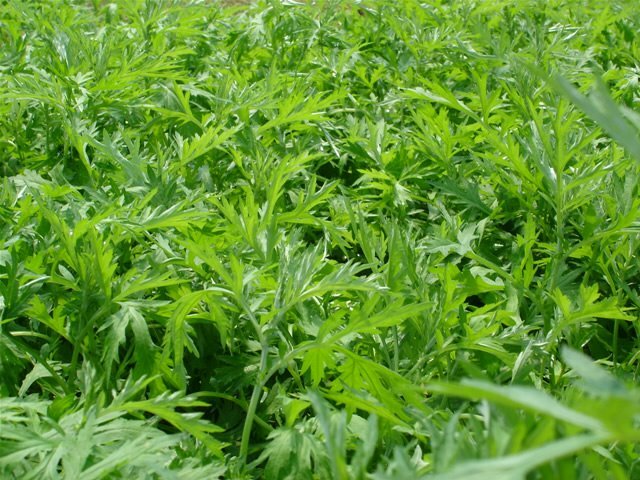 It is one of her multipurpose herb, I remember her having them soak in wine, so it can be used as ointment. Look how interesting they are. Winter Melon or in Chinese they call it "Dong Qua". If you like the "dong qua cha" can drinks, they are made of these. The same farm also has Spinach. Yeah, the veg that Popeye eats. 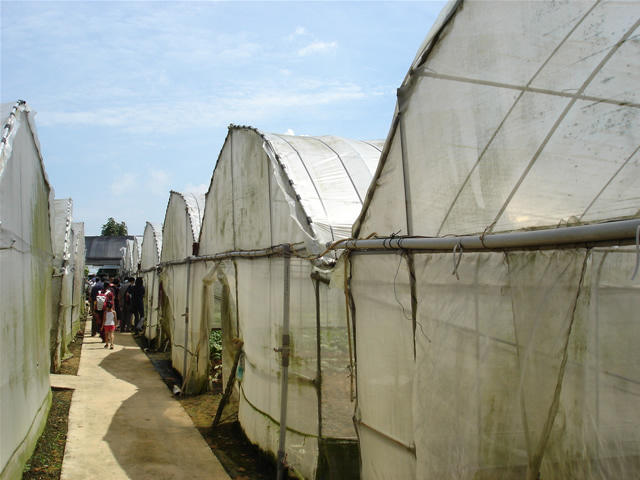 Do you know that Singapore has vegetable farms too? I visited one some time last year. This is radish. The farm is in Lim Chu Kang. 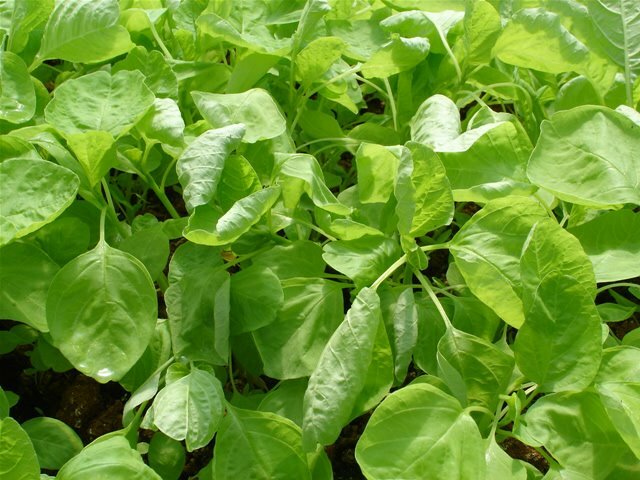 Most of the green leafy vegetables however does come from Malaysia and Indonesia.